Regional presidents work with their executive council and regional advisers to develop an agenda for each meeting. He/she presides at meetings, uses basic parliamentary procedure, and helps the group make decisions but does not make decisions for the group. The president sees that necessary committees and subcommittees are formed and that committee chairs are selected. The president may serve as an ex-officio member on committees. He/she knows the duties of all officers and committee chairs, starts meetings on time, and confers frequently with regional advisers on plans. The president may represent the region at special events. Make sure that you keep informed and current. Read carefully and thoroughly all correspondence from the state office and file them for future reference. Be familiar with regional, state, and national bylaws. Be particularly familiar with the the sections of the state bylaws regarding regional business. See that the parliamentarian chairs a bylaws committee as necessary to keep the regional bylaws up-to-date with the state and national bylaws, as well as reviews bylaws of new chapters. What do I need to send to the state office? When do I need to send information out to the chapters in my region? Prior to December 1st, all communications regarding regional meetings and screenings should be sent to EVERY school in your region. 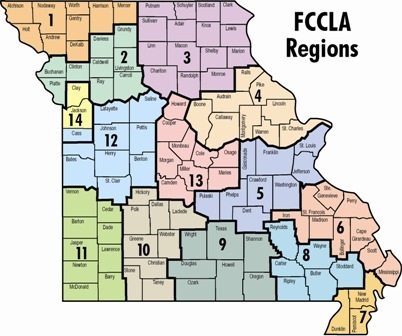 Addresses may be obtained from the Missouri School Directory, which can be found on the DESE webpage. Be sure to send communications in advance of regional activities so that local chapters have plenty of time to make plans. After December 1st communications may be sent to only chapters affiliated at the regional, state, and national levels. Schedule the regional elections after December 1st but before February 1st. Set a deadline of at least two weeks prior to the elections date for qualifications of officer candidates to be submitted to the regional adviser. Calculate the number of voting delegates each chapter is allowed based on the state bylaws. Inform each chapter of the number of delegates they are allowed to bring to regional elections. If officer qualification forms are reproduced for voting delegates, the reproductions should be quality ones. All personal information including phone numbers, address, etc., should be blacked out before copying. Remind the Regional Executive Council Members and Regional Advisers that their duties begin and end with regional installations.